Okay, so why am I reviewing a book about Jeff Buckley here on the Radar Station? Well, it’s written by Gary Lucas who had, and still continues to have, a big part to play in the music of Don Van Vliet, and I think, should interest a lot of Beefheart fans. 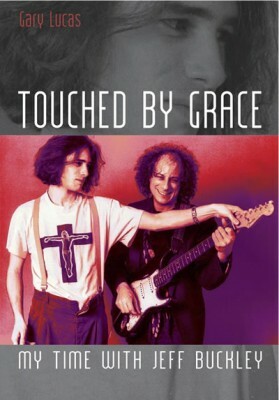 Originally published in Italy in Italian this is an updated English version of Gary’s story of his “time with Jeff Buckley”, in which he wants to correct the many previously published errors about their relationship and to counter the attempts at airbrushing him out of the story of Jeff’s musical development. It’s concerned with a narrow time frame but nonetheless an important one for both their careers. In the early 1990s Gary was making a bid for a big record label deal based around his band Gods and Monsters. He was introduced to the good looking Jeff Buckley, son of the legendary Tim. They hit it off and began making music together – Gary’s intricate guitar instrumentals became the backdrop to Jeff’s words and amazing vocals – ‘Mojo Pin’ and ‘Grace’ being the two most well known examples. The magical beginning though soon began to unravel and ultimately had a tragic end. This story contains one of the great ‘what ifs’ of music. What if they had continued as this highly creative writing partnership? That’s certainly how Gary had seen things developing, with Jeff becoming the voice of Gods and Monsters. However, that wasn’t to be as Gary found himself ground down between the machinations of big record labels and Jeff’s mercurial personality. Jeff saw himself as the rock icon, the leader of the group. Although he seemed to realise Gary’s music was essential to make his songs better than they were his ego (encouraged by the record company) didn’t allow him to be one half of a partnership. So eventually it all crashed and burned. Jeff’s self-destructive urge, dabbling with heroin and taking that final swim ended any chance of reconciliation and future collaboration. It’s a sad story which Gary writes about candidly and with passion. He’s a good writer. He was, after all, a copywriter with CBS for many years so has a way with words. The book is easy to read although there are a couple of passages that get repeated. And, as with all books these days, it could have done with another proof-read – I’m sure Gary is kicking himself that Tim Buckley’s ‘Jungle Fever’ is mentioned as being from ‘Blue Afternoon’ instead of ‘Jungle Fire’ from ‘Starsailor’. But apart from that I didn’t spot any errors. His time with Jeff was obviously an important part of his life, in the same way that being with Beefheart was. These two big personalities have come to spread a large shadow across Gary’s subsequent solo career. Despite his impressive back catalogue it may be sometime before he is recognised for his own work rather than his collaborations with these two. But then he does continue to celebrate and keep alive the musical legacy of both of them through his various Beefheart tributes and his shows focusing on Jeff Buckley to coincide with the publication of this book. So, he himself cannot shake them off even if he would like to. The book is a great read. I enjoyed it although I never understood the success of Jeff myself. For the Beefheart fan there are some mentions of Gary’s time with Don. What I also found interesting was reading about the creative writing sessions, how a song came together, and Gary explaining about some of the many effects pedals and gizmos he uses to get those incredible sounds from his guitar. And, of course, there’s the stories about the convoluted intrigues of record companies which is also fascinating (as long as they don’t involve you)!